Here is what The Washington Post published on September 18, 2014, shortly after Apple’s Keynote on September 9, the day Tim Cook introduced the iPhone 6 and 6 Plus and the updated operating system iOS 8 for mobile devices. Beside 2-Step Verification also available for iCloud in many countries this is a further step to more security for Apple’s customers. It should be mentioned that the so-called fragmentation is kept low for Apple’s devices. 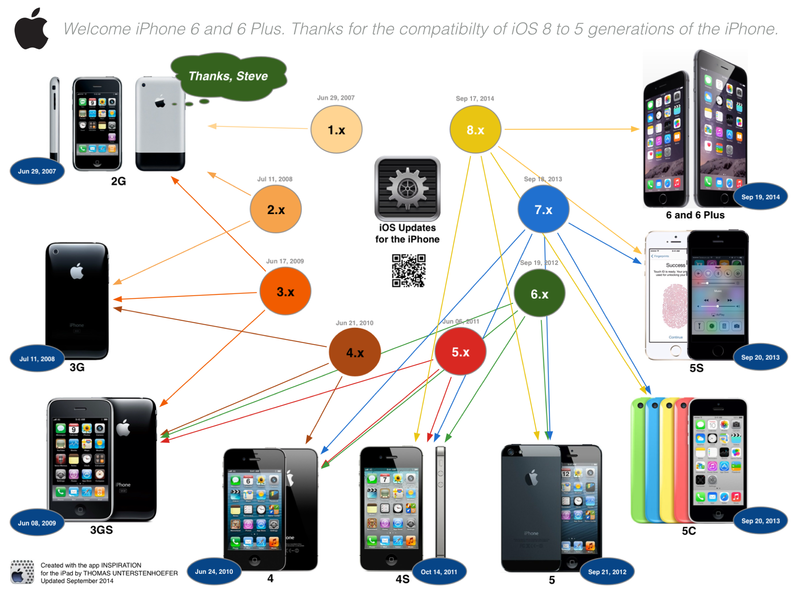 See this concept map which shows the iOS versions in relation to all iPhone models on which they can be installed. The map includes what’s published about iOS 8 on Apple’s website after the WWDC event on June 2, 2014 in San Francisco. Just look at the iOS version and count the number of outgoing arrows. It starts with compatibility to 2 models. Since iOS 6 the installation on the actual model and 3 predecessors is supported. With iOS 7 and 8 Apple’s mobile OS is ready to install on 5 models. It needs enormous efforts to bring hardware and software engineers together to look into the future and design hardware components usable also for future versions of an OS. Competitors show us that the alternative way is to build devices regardless what happens with newer versions of the OS. According to a scary graphic for Android users published by Business Insider in Aug 2014 there are 18,796 unique devices running the Android OS. That fragmentation is tough on developers. It’s too difficult to make sure that an app runs well on each device. It’s one of the reasons why Android has severe disadvantages for customers using their device over years. The issue gets thornier if you look at the OS versions Android devices are running today. Many of them are still running Gingerbread (2.3), a version launched 4 years ago! In contrast to Android about 91% of iOS devices are running the latest version (7.x) and it’s most likely that a significant percentage of devices will be updated to iOS 8 on the first day of its launch. It’s a vicious circle to always buy a new (subsidized) device to get the latest OS version. Fragmentation is what developers and customers don’t like because it hampers a unique user experience and needs additional efforts. This might be one of the reasons why iOS is still the preferred platform for developing powerful apps. Apple wants a perfect user experience for most of it’s loyal customers and developers are supported by the iOS feature ‘Size Classes’ with which Apple said Goodbye to an increasing complexity of code needed to support sizes like 3.5″ (iPhone 4), 4.0″ (iPhone 5), 4.7″ and 5.5″ (iPhone 6), 7.9″ (iPad Mini), and 9.7″ (iPad). Google with its Android OS is still faced with a lot of different form factors and it seems to be an impossible task for developers to ensure a perfect user interface and user experience on all devices. 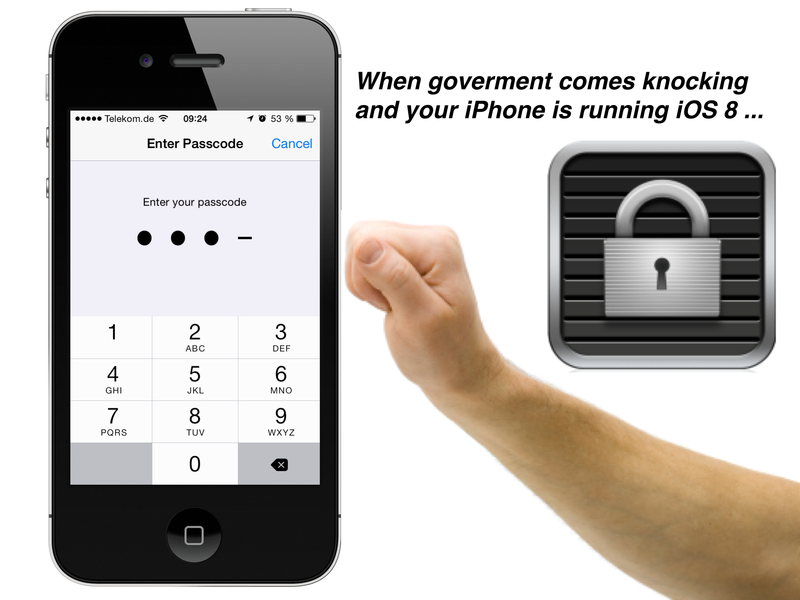 Security isn’t what Apple is just talking about like many other companies. Today security is strongly related to updated applications and operating systems. Apple reported that nearly half of the users installed the latest version of the mobile operating system less than a week after its introduction on Sept 17, 2014. The company said 46 percent are using iOS 8 as of Monday, with slightly more (49 percent) using the previous generation of software. This is an adoption process happening nearly with the speed of light if you compare it with the competitors. Interested in creating mind maps and concept maps?